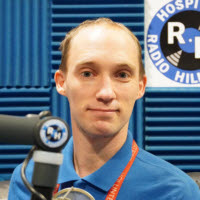 I joined Radio Hillingdon in 2017. I started visiting the wards with Graham and sitting in with Claire and Divya Sachdeva on Wednesdays and enjoyed it. I especially enjoyed 'Wednesday at the movies'. Once I met Phil, he and I just clicked and now Phil and I present the Friday request show. If you have seen me around the hospital, I also work at the Hillingdon Hospital shop. I am autistic and have ADHD but that hasn’t held me back in achieving my goals in life. My hobbies include listening to music, playing pool and watching movies.